Sleeping is one of the most important activities that we do as humans. We rely on sleep to help us with cognitive and homeostatic functions, along with directly affecting our health (mental, physical, psychological, emotional, etc), lifestyle, and neurobehavioral performance. Not having enough sleep per night can negatively impact our daily lives, from inhibiting skin barrier functions to metabolic dysregulation and intrinsic skin aging. In our sleeping state, our body goes through a renewal and regeneration for different functions and processes, with numerous physiological changes in both NREM (non-rapid eye movement) and REM (rapid eye movement) sleep states. Whether it's to strengthen immune system defense, conserve energy, repair cells, regulate hormones, decrease hypertension, or maintain metabolic and endocrine states, having a good night's sleep is needed for our overall health. After taking all of this information in, you can see why having enough sleeping per night is so important. For me personally, I do not get enough sleep. Due to numerous factors like stress, I mostly get half of what is recommended per night (about 7-9 hours for adults). I definitely can feel a difference in my skin now compared to a few months ago when I was getting about 6-7 solid sleeping hours. Thankfully I've been able to use products featured in MINTD's October box to help bring a sense of relaxation and serenity to my environment and self. 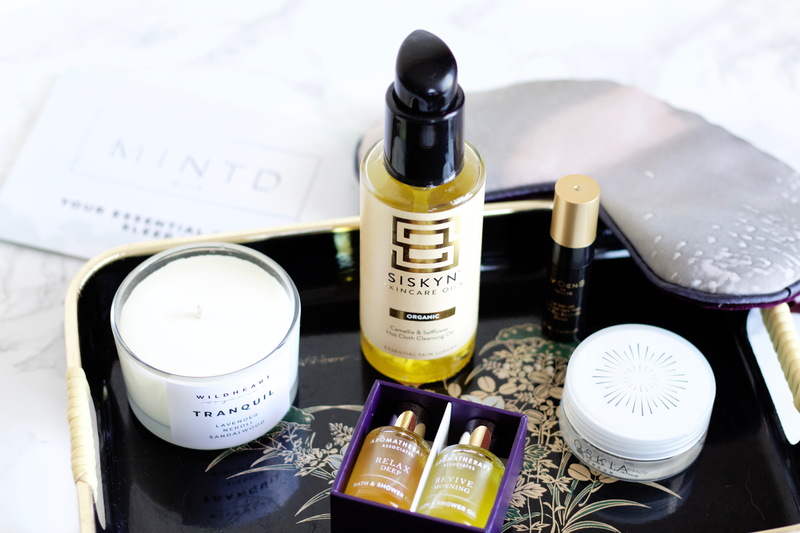 If you're unaware of who MINTD Box is, they are a UK luxury monthly/bi-monthly subscription box service that offers only the highest quality luxury brands at value price with full sized products in every box. The concept is that you are getting more than what you are putting into it money-wise, while also trying out products from a variety of luxury brands from trusted retailers and ones currently globally on trend. I have two posts about their boxes from September (here) and August (here). They are such an organically presented brand and I'm constantly impressed by their product and brand choices. They don't make me doubt them when it comes to selections, and they especially don't come off fake or untrustworthy. It can be too easy to fall into the cheap allure of subbing to a company based on price, but I've personally found the quality of most boxes to be very under par (which is why I've unsubbed to so many, even bigger name ones). MINTD Box is truly a unique and special subscription box company and I highly recommend them! October's box is themed The Essential Beauty Sleep Kit*. It aids in helping you to "get the best sleep you've ever had" by using various luxurious products with aromatherapeutic and relaxing benefits. 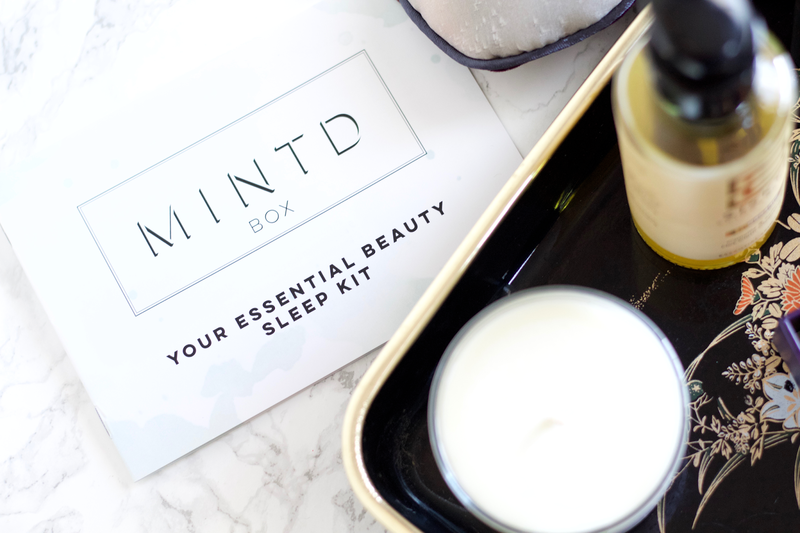 The MINTD Box team understands how vital sleeping is for an individual and how challenging it is to do, depending on environmental and personal factors. They have carefully handpicked 2 full sized and 4 travel deluxe sized products to help you get your much needed beauty sleep and keep your skin looking fresh and youthful. These products can easily be found at retailers like Harrods, Space NK, Liberty London, Cult Beauty, Selfridges, and their own official webstores. MINTD Box ships to the UK, W. Europe (see full list of countries here), N. America, Australia, and New Zealand. This box gives you biiiiig savings. The price of all items together retails at 178$/145£/162€, which gives you a savings of 99$/80£/89€ since the monthly price per box is 79$/65£/73€. I'm sure you're looking at those numbers and are a bit overwhelmed. I like to break it down like this: usually one of those FULL SIZED items (that you actually like) costs about the same amount of money for a one month's subscription. Due to the fact that MINTD Box beauty experts find the best quality and on-trend beauty products from a variety of brands, you're bound to at least find one luxury item that you'll truly fall in love with. Let's compare that with spending month after month on a subscription box that you may only like less than half of the items, even though you are paying a low amount per month. In my opinion, it's really not worth it at all to keep subbing if you're not even fully satisfied and if you don't get a true value out of the money amount saved and spent. Even if you did end up not liking an item in one of MINTD's boxes (all on personal preference), you honestly are not even losing out since you really only paid for one FULL SIZED item's worth. It's truly a win/win situation. I honestly cannot believe how great this box is, both in product selection and brands, and it came at the best time for me when I'm struggling so much with my sleeping cycle. I truly think this is one of the best MINTD boxes they've curated so far! Not to mention the scent that radiates from the box after opening it is just so beautiful. Seeing as this month's box is featured on the theme of beauty and sleep, the inclusion of not only skincare products but lifestyle as well is so brilliant. MINTD's mission to inspire and encourage women to help them feel confident and reveal their inner beauty is really brought out in this box. These products will not only treat your skin but inner self as well by helping you connect to a place far away from daily life stresses and worries. Whitehorn is a British textile design company founded by Janey Whitehorn, an award winning and globally recognized designer. By using Janey's expertise and background in weaving and dyeing, Whitehorn specializes in the hand dyeing of fine silks using marbling techniques to create fresh and modern color palettes with luxurious designs. This eye mask is so beautiful. It smells heavenly and as you wear it you breathe in the fragrance of English lavender that's filled inside of it. Being a calming and therapeutic scent, you really get the feeling of letting go of tension and negative vibes. I love the design of this and how luxe it looks, and I love having a rose velvet ribbon at the back to tie to keep on. You can tell that it's made with the utmost care, especially knowing that the design is hand painted onto 100% silk with an ivory satin trim. The padding is a rich plum color and is so soft on the skin. I find that the coloring is also very relaxing to the eye, as colors are effective as stimuli for cognition perception and behavior. 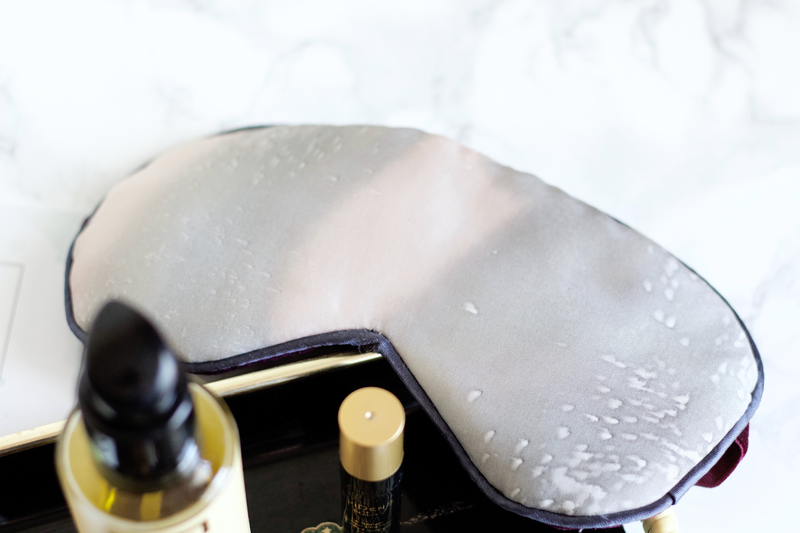 I think it was so smart of the MINTD team to include an eye mask, not only for aesthetic reasons but because this product is both beautiful in fragrance and very useful. Fragrances can have a substantial counter effect on stress and having complete darkness during your sleeping time is actually very important. Our body has its own 'clock' that naturally regulates a 24-hour cycle, known as the circadian rhythm, that is affected by behavioral, environmental, and mental factors. It is found in the suprachiasmatic nuclei (SCN) of the hypothalamus, working to regulate the clock and neurotransmitters for entrainment and efferent projections of controlling the circadium rhythm. The circadian rhythm releases melatonin (a hormone that causes you to get drowsy) from the pineal gland in response to our internal biological clock and specifically by the light/dark cycle. The circadian rhythm determines sleep patterns, since the pineal gland (pictured here) is located above the optic nerves (pictured here), which carry visual messages from the retina to the brain. I bring all of this information to focus because using a sleeping mask could help with an imbalance of the light/dark cycle. Since we use artificial light indoors (both day and night) and most of us spend a lot of our day inside for work/school (etc), light exposure is manipulated and limited and may be a cause for why many have disrupted circadian rhythms and suppressed melatonin secretion. I, personally, did not know this information beforehand and how important light is to our sleeping cycle. It really blew me away to research all of this and more. I never have been interested in using eye masks before this, but I rely on using it when I have migraines, when I feel the need to lay down and take a breather, and when I'm laying in bed trying to put myself to sleep. It really is such a lovely eye mask! 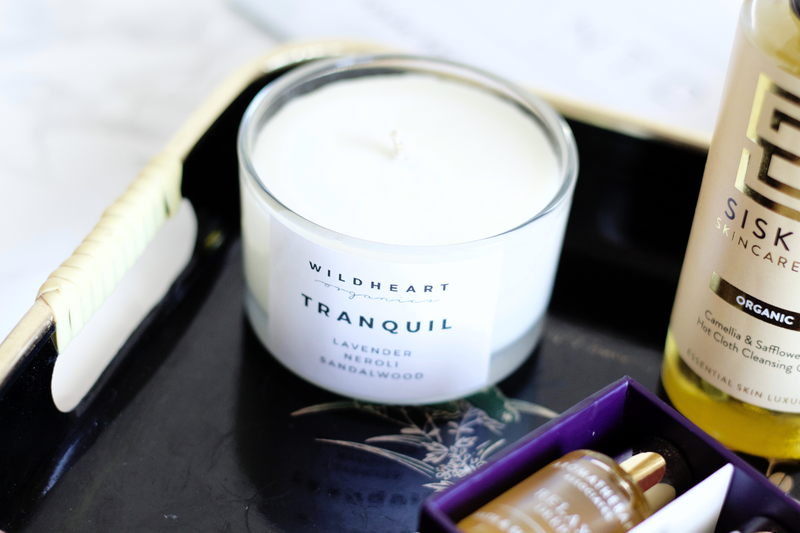 Wildheart Organics is a UK candle and home fragrance company that uses organic and natural essential oils to create luxurious treatment products with the ultimate therapeutic benefits. Being a lover of "all things healthy, aromatherapy and body beauty products," founder Emma Holt has beautifully curated a line of products using 100% essential oils to enhance and improve your mood and wellbeing. They use a lush blend of botanicals and florals, especially ones with aromas that are known to have mood enhancing benefits. Their line of aromatherapy candles are made with natural plant ingredients and are carefully picked, taking months to perfect their lush blends. They hand-make their products and do not test on animals, along with having an ethical approach to packaging by having all of the products be recyclable-friendly. Their candle waxes are a vegetarian product and their diffuser is a certified organic grain. I appreciate their dedication to not using petrochemicals, natural fillers or isolates, or toxic substances. Their product line is absolutely gorgeous and is divided up into mood categories (such as stress relief, happiness, relaxation, etc). Emma herself has written up wellness tips that are available to read on their website, one of them being how to practice mindfulness. All of their products are hand-made at their barn in Edinburgh, Scotland. 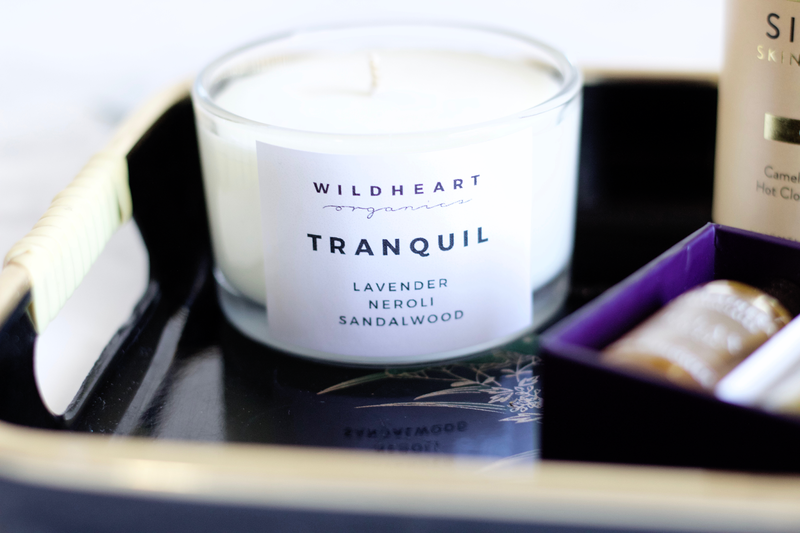 Their best-selling Tranquil Spa Candle is a lovely blend for the ultimate relaxing and sleeping experience. It is made with 12 essential oils that are all natural, non-toxic, and pure. Lavender and neroli blossom are at the heart of the formulation, with sandalwood, clary sage, and chamomile to add to the calming and relaxing scent. This candle is absolutely beautiful. That's really the only way to describe it and its fragrance. As soon as I took it out of the box and first took in its scent, I felt such a wonderful release of tension. The essential oils in this speak so loud to its benefits, as its fragrance is not too strong to overpower you. It is released as a semi-light aromatherapeutic scent. I like to light this candle as I'm working to relieve stress or especially when doing my night routine. It really creates the most calming and serene atmosphere. The travel size is actually small enough to take with you even in a smaller bag, and I find that the glass packaging really adds to the luxe feel of the product. It works very well when its lit and to distribute the fragrance in the room/area where you have it. I am for sure picking more up myself! I don't think I can be without this candle as its really helps to lower my stress and anxiety levels. I love the presentation too with how simple and minimalist it is. I would love to visit where they make their products, from the pictures it looks so gorgeous. I really can understand how Emma is so inspired to create her line. 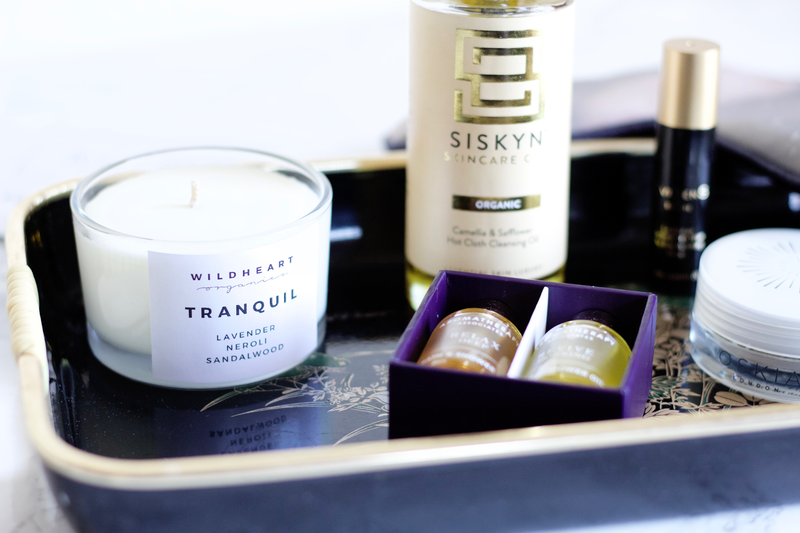 Unfortunately it seems that Wildheart Organics doesn't ship outside of the UK, but a small collection of products are available online at Sulis & Thermae if you are international. 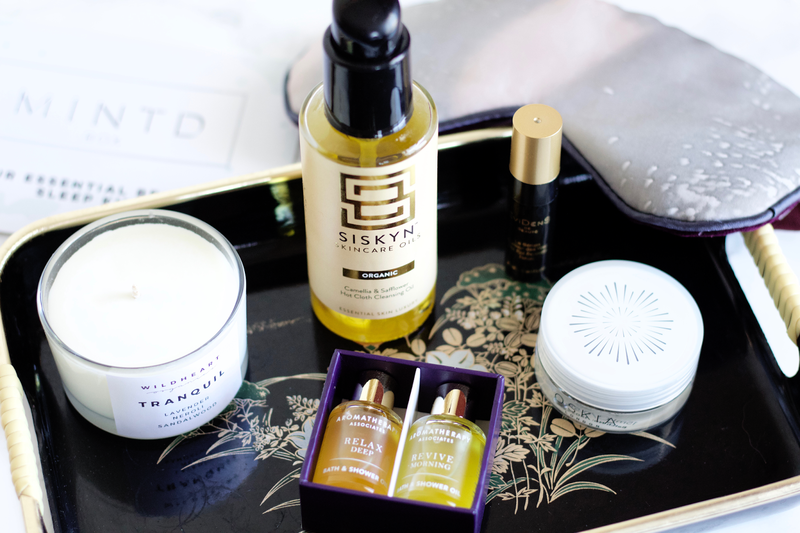 Siskyn Skincare Oils is a green UK luxury skincare brand created by two sisters that focuses on using highly effective and 100% natural, vegan ingredients. 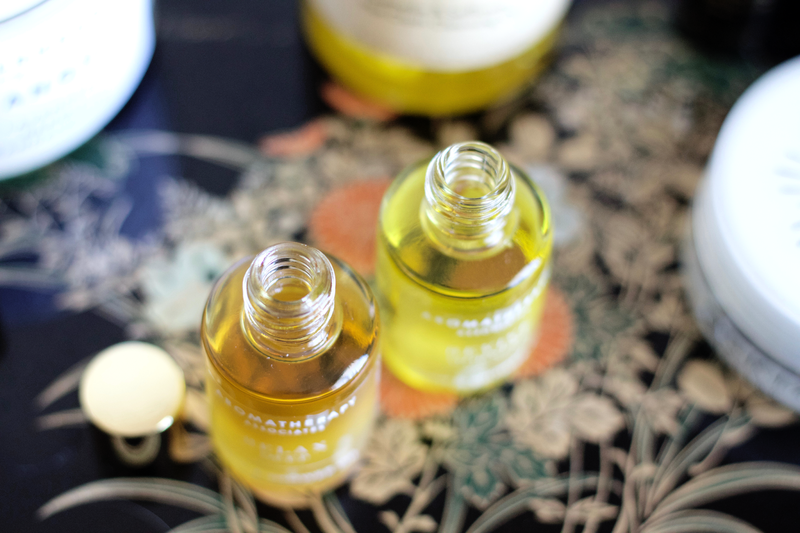 After a trip to Australia where one of the sisters, Sarah, found out about the nourishing and effective treatments that botanical oils provide, the two of them worked hard to create their own blend of oils. False marketing plays a big part when it comes to selling an oil product, especially when they claim to have vital, botanical ingredients. Non-green ingredients like artificial fragrances, dyes, and fillers often make their way into many oils that are on the mass market today; making those good botanical ingredients become inferior. 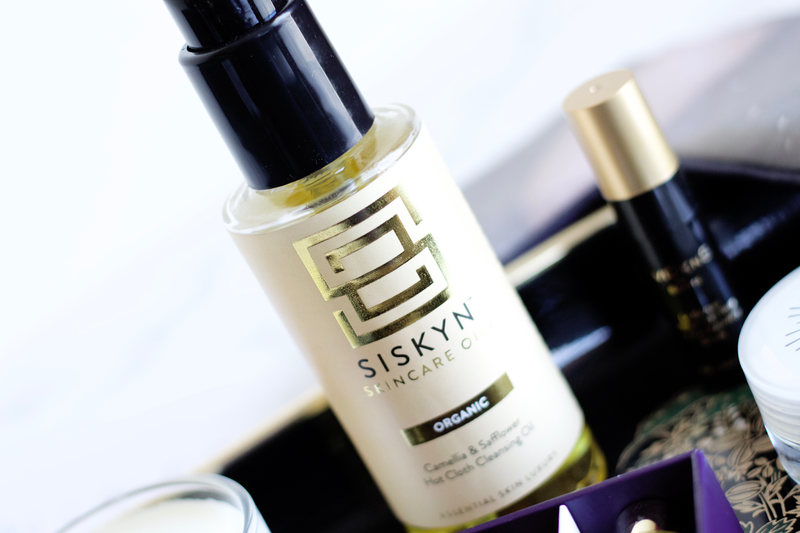 Discouraged by the lack of clean and high quality products on the market, they set out to create Siskyn Skincare Oils. Their oils have no synthetics, derivatives, fillers, artificial preservatives or fragrances, silicones, parabens, dyes, petrochemicals, or added preservatives. Not even water is included, as their basis has always been to create true and pure botanical oil sourced products. They have a whole list of 43 botanical oils they use as ingredients on their website, along with a page explaining why botanical oils are so essential to use. They really are an impressive company that express a very honest transparency and authentic knowledge for their customers, which is something I really respect and appreciate. Luxe: rose, neroli, frankincense, jasmine, myrrh, and macadamia to provide a luxurious blend. Elixir: lemon, seabuckthorn, grapefruit, sweet fennel, helichrysum, calendula, rosehip, and tamanu to provide brightening, toning, and soothing blends. Organic: rose, neroli, jasmine, frankincense, camellia, safflower, myrrh, and macadamia to provide 100% organic, luxury blends. Their products range from day/night oils to cleansing and body oils. Organic Camellia & Safflower Hot Cloth Cleansing Oil is an award-winning cleansing oil that is gentle to use and effective for melting away makeup and other impurities. It's blended to balance and work with the skin's natural oils to leave your skin clean, nourished, and glowing. It is full of 100% certified organic botanical oils: Castor (anti-inflammatory) and Safflower (soothing and moisturizing) lift impurities from the pores and help retain moisture, Camellia (one of my favorite ingredients in skincare!) heals and balances, Avocado and Olive both provide extra moisturizing benefits, Jojoba works amazing for oily skin to balance and nourish, and Rosehip, which is rich in Vitamin A and has wonderful healing and rejuvenating benefits. The linoleic and ricinoleic acid content in the cleansing oil are great ingredients fro those who have acne, since they are anti-inflammatory and light, and for dry skin, since they work as an emollient. This cleansing oil is beautifully made and makes the skin so soft after using. I will be honest and say it does feel quite heavy on my oily, acne prone skin but the benefits of having such favorable and high quality ingredients make this product a treasure. Camellia sinensis and rosehip are two of my favorites and I often pick out products if I see that it contains them at considerable levels. Rosehip works very well with my oily skin, as it provides great nourishing and skin repairing benefits. Camellia sinensis is a small tree with leaves that are used to create green tea, making it a great ingredient as a tea seed oil that is light and hydrating, and particularly helpful to those with acne and other skin types/concerns. 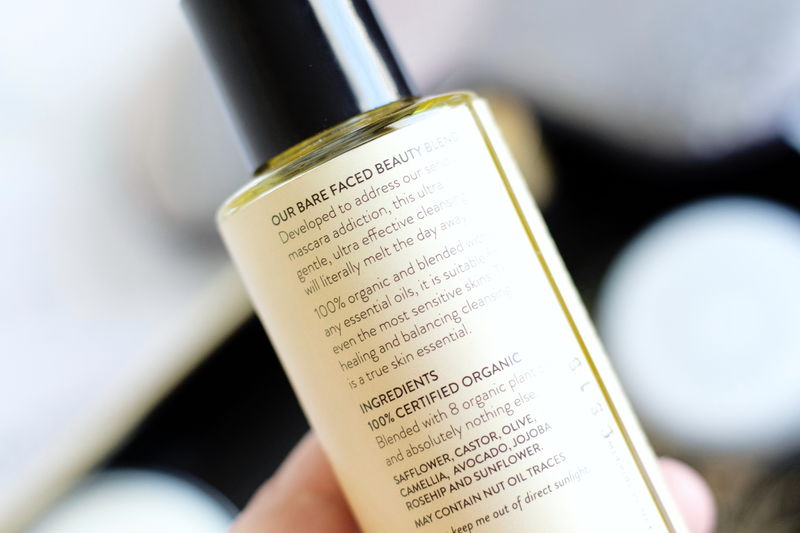 This cleansing oil actually comes with its own cloth, which is a really nice addition. The way to use this is to apply the cleansing oil and massage it into the skin, then run the cloth under some warm water and wring it out before wiping away the oil on your face. At the moment, my skin is on the drier side and I've been using this cleansing oil mostly at night since I still get pretty oily during the day (although it has lessened). It makes my skin not only feel soft but also very hydrated beyond the skin surface. The good thing about this is that it doesn't leave any oily residue, which is something I have a problem with when it comes to cleansing oils being too heavy. You can also use this on your eye area as it won't sting (so glad about that!). It has an interesting smell, which I think reflects back on the castor and safflower ingredients. I like to use this cleansing oil when I'm not wearing too heavy makeup, as I do find it takes off makeup well but I like feeling more of the product on my bare skin. 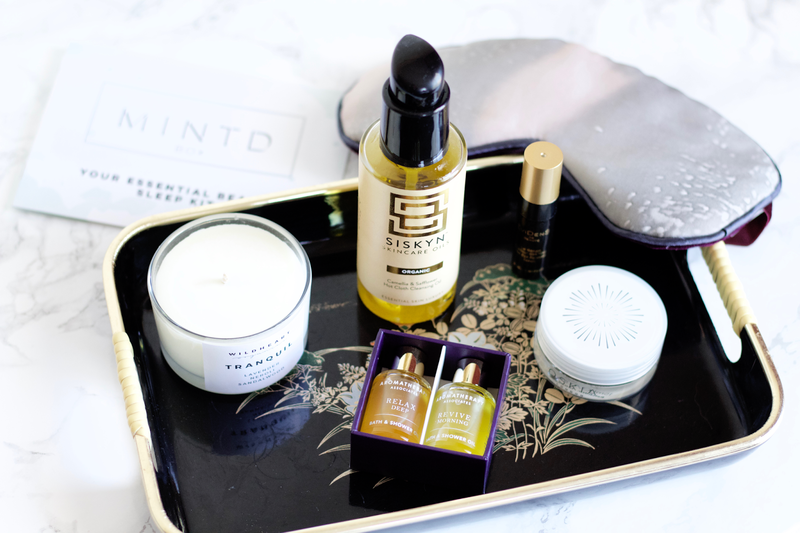 This truly is a luxurious and high quality product, and I'm so glad that MINTD Box can introduce me to such wonderful brands and products like this one. I'm interested in trying more from this brand and I hope I can do it soon as the colder temperatures make their way to Southern California. Ingredients: (100% certified organic ingredients) Ricinus Communis (Castor) Seed Oil, Carthamus Tinctorius (Safflower) Seed Oil, Persea Gratissima (Avocado) Oil, Olea Europaea (Olive) Fruit Oil, Helianthus Annuus (Sunflower) Seed Oil, Simmondsia Chinensis (Jojoba) Seed Oil, Rosa Canina (Rosehip) Fruit Oil, Camellia Sinensis (Camellia) Leaf Oil. May contain nut oil traces. Aromatherapy Associates is an aromatherapeutic luxury skincare brand that concentrates on using essential oils and botanicals for healthy, glowing skin. Free from harsh chemicals and synthetics, their products are filled with natural ingredients and made into lush blends to deliver fantastic results. They use certain products for effective and quality purposes, such as using damask rose instead of water, omega-rich botanicals and vitamin abundant ingredients like jojoba and evening primrose, and sourcing raw natural materials straight from the farmers who cultivate them. 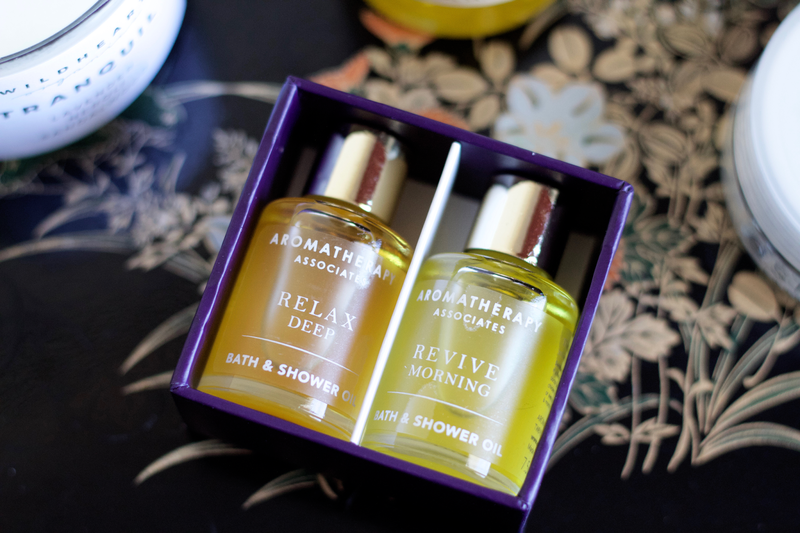 Aromatherapy Associates relish in using essential oils and botanicals for their products as both combine to create an aromatherapeutic atmosphere, working to ease the mind and sooth the skin. Before this I never had tried anything from them but have always wanted to, it's why I was so excited to get these two in this month's box! Perfect Partners is a luxurious duo that contain two of their most popular and award-winning bath oils, Revive Morning and Deep Relax. They are housed in 7.5ml bottles and can be used either topically applied before a bath/shower or poured straight into a bath. They both have quite differing scents, as Revive Morning smells more citrus-y and Deep Relax smells very much like patchouli and other herbs mixed together. They also are very strong scents and it's why I have only used a little bit at a time for each. I'm not the biggest fan of either fragrance (especially Deep Relax, it's very heavy) but seeing as they are two of their most popular products, it seems that many appreciate and adore them. I think that scents are a very personal experience, and every individual gravitates towards specific kinds. For myself, I usually stick with more light, floral scents, but do enjoy herbal ones too. These feel very moisturizing and luxurious once applied onto the skin, but I think if you're very sensitive to fragrances then you should be careful when using these as they are very potent once applied. 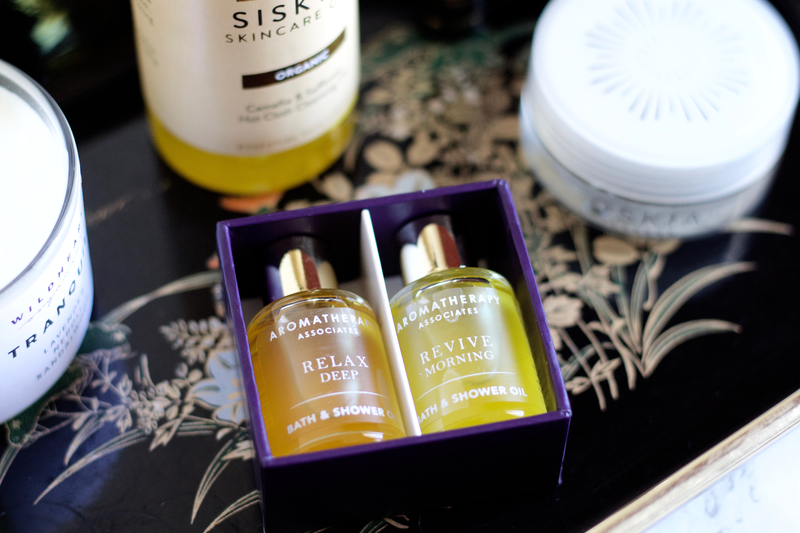 Morning Revive is much lighter than Deep Relax, and I used it the most of the two. It does remind me of some cough medicine I used to take when I was younger, however. I think these are such high quality and beautiful oils, but the fragrances are just not for me. It actually caused some irritation deep in my throat and chest after every use (plus coughing and sometimes a migraine), so I have not used them consistently. I would love to try other products from Aromatherapy Associates, as I hear so much about the brand and how wonderful their essential oils blends are. 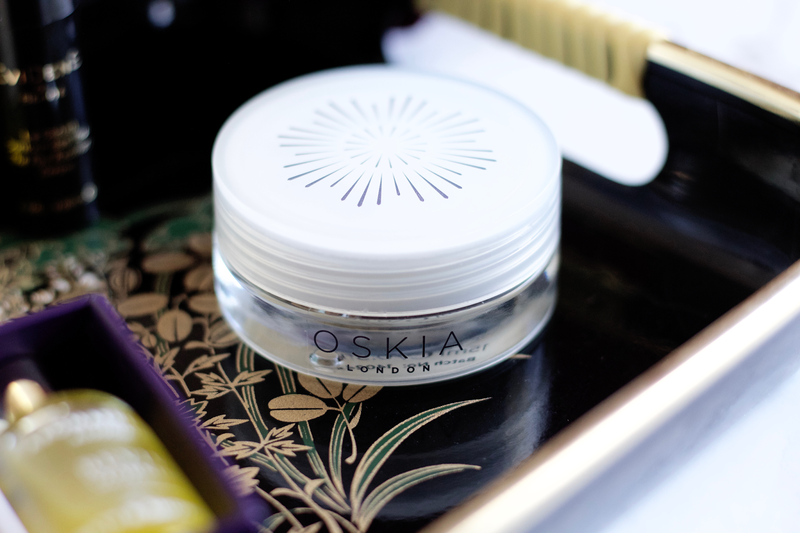 Oskia is a British luxury skincare brand that offers a scientific way to skin health, by using patent bio-technologies and 'beauty mineral' MSM (an organic sulfur compound) as their specialty ingredients to get a brighter, youthful complexion. MSM boosts collagen production and is important for cell regeneration, along with working well to treat skin conditions like acne, eczema, psoriasis, and other conditions. They have multiple patented bio-actives and use a mass amount of bio-available nutrients (vitamins, minerals, glucides, omegas, and proteins/amino acids) in their skincare products. 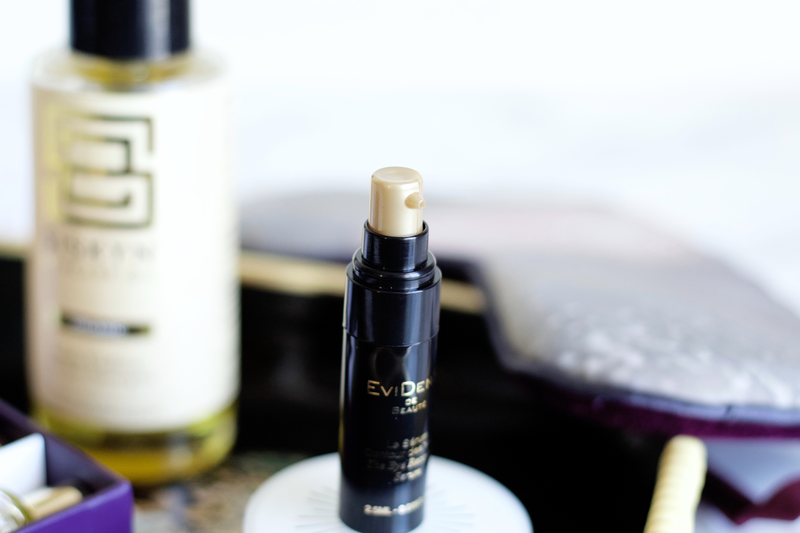 I've been a huge fan of Oskia for a long while now and have been wanting to try more from their range, as I am in love with their Super 16 Serum (mini-reviewed here) and Restoration Oil. I also have their Renaissance Brightlight but have yet to use it. 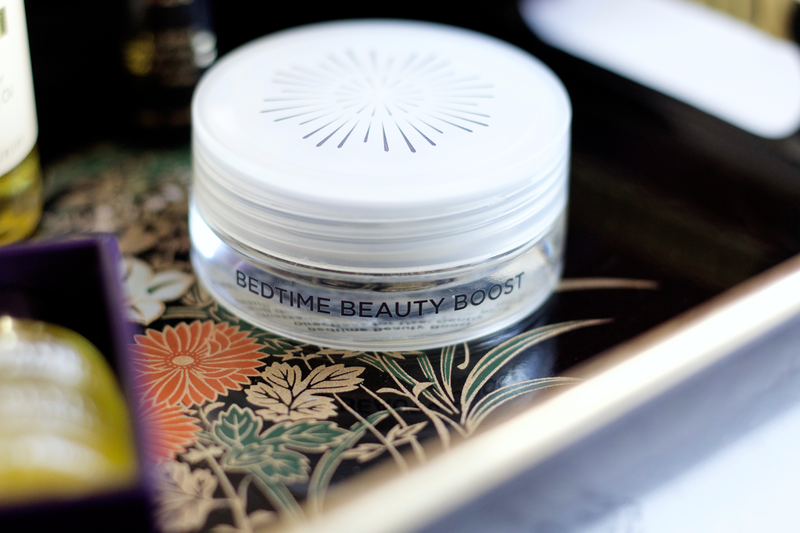 Bedtime Beauty Boost is a thick, luxurious night cream that is packed with anti-aging ingredients, nutrients, and floral extracts to supercharge your skin overnight and prevent signs of aging by giving a softer, healthier-looking complexion. Rich in essential cell nutrients and anti-aging actives, it claims to hydrate, brighten, and stimulate the skin's natural regeneration process. By reducing the appearance of wrinkles and age spots, it is supposed to give your skin a naturally radiant and youthful glow. Important to note is that it is formulated with Oskia's signature MSM repair and regenerating complex. It has great botanicals like Jojoba oil, Rice Germ oil, Rosehip Seed oil, Kukui Seed oil, Damask Rose oil, and a chunk ton of vitamins (like Vitamin E, which protects against free radical damage) and skin treatment ingredients (like Niacinamide, Hyaluronic Acid, Milk Peptides, Omegas-3, 6, 9 etc). 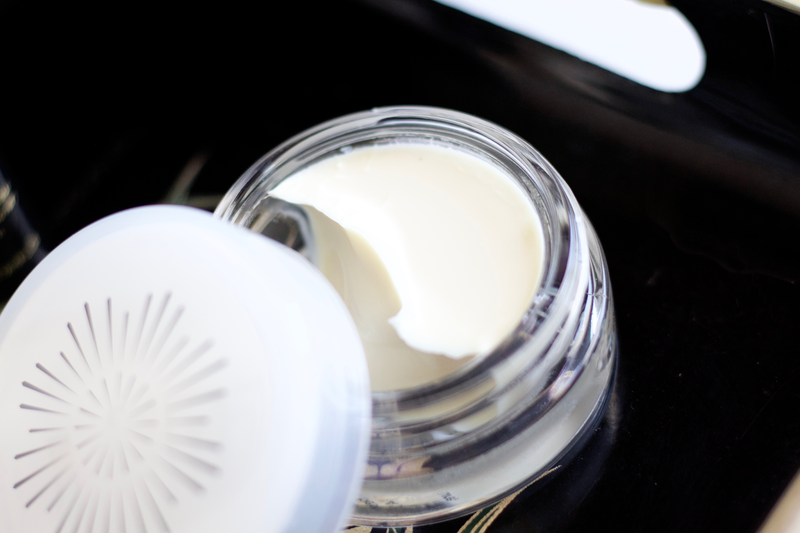 I really like this thick cream, it's been great to use on days where my skin is on the drier side and when I want to wake up with a smoothed, plump complexion the next day. Oskia says that it smells like Bulgarian Rose and their signature Rose-Lychee, but honestly it doesn't at all. The smell reminds me of putty clay, that's the best way I can describe it, which is a bit of a let down but not a deal breaker for me. You don't want to use too much of this night cream at one time, it can get really heavy quite quickly. It softens my skin really well, though, so I'm tempted to add more at times but you only need a little amount. For 15ml travel size, this looks like it will last for numerous amounts of uses. I've only used it about 4-5 times so far but I'm excited to see if I get all of the results that they claim, as I didn't really notice any brightening factor and I love using brightening products (Niacinamide is pretty down there though, so fingers crossed). Ingredients: Aqua (Water), Methyl Sulphonyl Methane (Msm), Glycerin, Simmondsia Chinensis (Jojoba) Oil*, Sesamum Indicum (Sesame) Seed Oil, Glyceryl Caprylate, Decyl Oleate, Cetearyl Olivate, Sorbitan Olivate, Butyrospermum Parkii (Shea) Butter*, Oryza Sativa (Rice) Germ Oil, Cetearyl Alcohol, Hellianthus Annuus (Sunflower) Seed Oil, Aleurites Moluccana (Kukui) Seed Oil, Rosa Canina (Rose Hip) Seed Oil, Niacinamide, Benzyl Alcohol, Glyceryl Dibehenate, Whey Protein, Tribehenin, Calendula Officinalis Flower Extract, Malus Domestica Fruit Cell Culture, Lecithin, Sodium Hyaluronate, Parfum (Natural Fragrance), Rosa Damascena Flower Oil, Citronellol, Geraniol, Linalool, Glyceryl Behenate, Xanthan Gum, Tocopherol, Dehydroacetic Acid, Phenoxyethanol. * Organically Certified Ingredient. Natural Ingredients. EviDenS de Beauté is a French luxury skincare brand that takes its roots from Japanese beauty rituals, creating a fusion of East and West. They use formulations created in their Tokyo-based lab, Laboratoires Montaigne (here's a video showing the lab), under the guidance and expertise of trusted hands to continually perfect and improve EviDenS skincare products. They formulate and aim their products for even the most sensitive skin. I was very interested while watching the video talking all about the background of the brand and its founder, Charles Edouard Barthes. He began EviDenS after noticing how his wife, Eriko, was not having the best reactions and outcomes from her anti-aging skincare. He explains that the brand has been created out of "a love story" between him and his wife, as he wanted her to have the best for her skin needs. I also found this video of them on Japanese TV, with him speaking in Japanese about how he created it in honor for his wife. Barthes uses his own experience and knowledge from his background as the the CEO of Haute Couture fashion brand, Jean-Louis Scherrer, to offer a sophisticated style to EviDenS. Eye Recovery Serum is a fine-textured nano-emulsion that provides a regenerating treatment. It claims to smooth wrinkles and fine lines, erase dark circles, fight signs of fatigue, and plump the fragile and thin eye area. It claims to restore youth and bring a glow to the eyes, and by looking at the ingredients I don't doubt it with longer use! It uses high quality and efficient ingredients like pure La Foux spring water, Triple Collagen, Q10 co-enzyme (I talk about the importance of this valuable anti-aging ingredient here), Amino Acids, Mulberry Root Extract, smoothing and stimulating ingredients like Vitamin K, Hyaluronic Acid, and Sorbitol. This product is wonderful for the under eye because of how thin and emulsifying it is. Once it sets it gives a soft, velvety feel and properly hydrates the eye area. I use it both on my eyelids and also for my under eye. I don't have any trouble when it comes to puffiness, but I do have issues with hydration, so this mostly took care of that worry of mine. It smells beautiful and is a light fragrance. This retails for over $200 in American dollars, so I feel like I'm holding some diamond in my hand! Even though it is a small travel-sized product, I believe I can get a good amount of uses out of this, so I've been selective when I use it since it is so luxurious. The packaging and overall display of EviDenS products speaks true to the luxurious feel of their product formulations. I had never heard of this brand before this but I most certainly won't forget them. 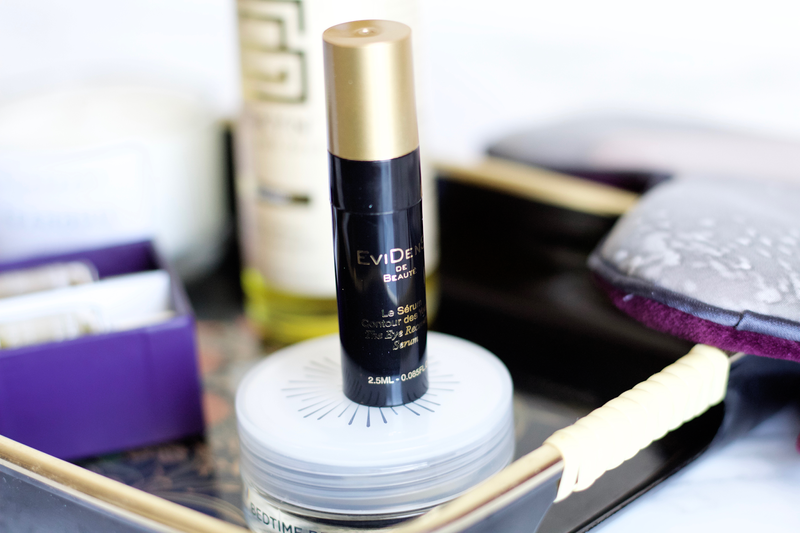 I'm not sure if I can account for any anti-aging effects from this eye serum, since I've only used it for a short amount of time, but it is very promising. Ingredients: Aqua (Water), Squalane, Triethylhexanoin, Glycerin, Butylene Glycol, Neopentyl Glycol Dicaprate, 1,2-hexanediol, Dimethicone, Glyceryl Stearate/peg-100 Stearate, Glycosyl Trehalose, Hydroxyethyl Acrylate/sodium Acryloyldimethyl Taurate Copolymer, Behenyl Alcohol, Hydrogenated Starch Hydrolysate, Polysorbate 60, Stearic Acid, Aqua (Water)*, Sodium Pca, Sodium Lactate, Phenylalanine, Histidine, Isoleucine, Threonine, Arginine, Aspartic Acid, Pca, Proline, Valine, Glycine, Alanine, Serine, Camellia Sinensis Leaf Extract, Morus Alba Root Extract, Alcohol, Hydrolyzed Collagen, Soluble Collagen, Pentasodium Pentetate, Ubiquinone, Sodium Benzoate, Phenoxyethanol, Citric Acid, Sodium Hydroxide, Ppg-4-ceteth-20, Hydrogenated Orange Roughy Oil, Tocopherol, Rosa Canina Fruit Oil, Persea Gratissima (Avocado) Oil, Prunus Armeniaca (Apricot) Kernel Oil, Natto Gum, Algin, Sodium Hyaluronate. *eau De La Foux, Côte D’azur, France. MINTD Box has curated another beautiful box full of wonderful products, and I'm always so in awe of the hard work that Cheryl and her team does. What's great about MINTD Box is that you have the power to choose your own subscription type! They offer monthly/bi-monthly (£65), 3 month (£190.50), 6 month (£381), and 12 month (£762) subscription plans. All of them can easily be cancelled through a hassle-free process. If you're ever in doubt, customer service is there to help you with any and all questions. MINTD Box also has been kind enough to offer a 10% off non-affiliated code for your first box: 10OFF1ST. You can subscribe here. Please share if you are interested or will be subbing to them! I highly respect and appreciate all of the work and diligence put into creating these high quality monthly boxes. MINTD Box deserves all of the success and more. The October box is only available for a limited time, so be sure to get it while you can if you're wanting it! Did any products here peak your interest? What are your favorite products to use for relaxation/pamper time? *This product has been kindly gifted by MINTD Box. See my disclaimer for more information.